Colman CA is San Francisco's necropolis given that burying people is illegal in San Francisco County. 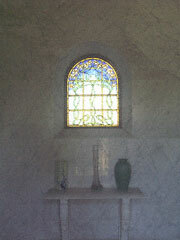 While on a recent trip there, I was impressed with the stained glass in the numerous mausoleums. Click on a picture to see larger image.